This Joomla Virtuemart Extension is a great add – on module for your Virtuemart store. 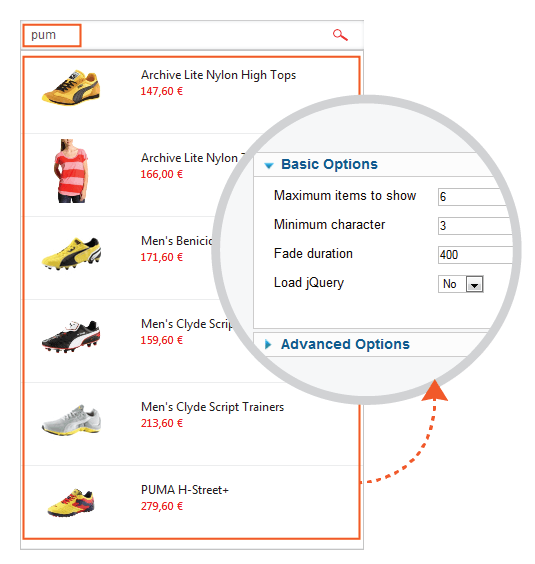 The module will help your shoppers to easily find the products based on Keyword Search. With Ajax empowered technology, visitors do not have to wait for the whole Virtuemart page to reload to see their search results. They just need to type 3 characters of keywords and the products with the same keywords will beautifully displayed together with the product photo thumbnails and Prices. You can set a number of search results to be displayed in case you have many products of the same keywords. 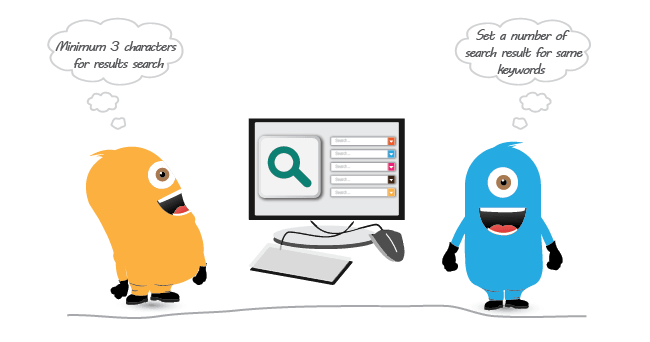 Find products based on Keyword Search easily. This Joomla Virtuemart Extension is a great add on for your Virtuemart store. The module will help your shoppers find products based on Keyword Search easily. With Ajax empowered technology, visitors do not have to wait for the whole Virtuemart page to reload and get their search results. They just need to type 3 characters of a keyword and results will be beatifully displayed together with an image thumbnail and the price. You can set a number of search results in case you have many products for the same keywords. there are always reward for people who dare to try the new things. I think that your product is the reward I had achieved. After using your extension, I receive a lot of compliments from my customers relating to the convenience of searching by keywords. Good product! Good job! Great extension, helps customers quickly search for what they need and save time. I am satisfied with this product. Another technological feature is indispensable in any professional website, helping customers find what they need easily with a beautiful display with photos and prices. I love technology and love your product. 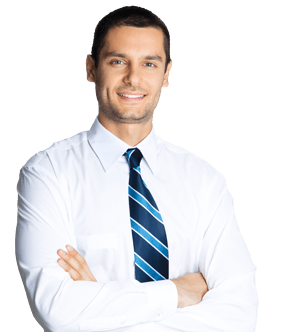 Products with great utility, the modules help my customer easily find the product as they are looking for based on keyword searches. Helps save time and very friendly for customer. Thank Cmsmart. 1. Does this product search into virtuemart custom fields? 2. Does this product support partial/substring matches? Virtuemart Ajax Search Pro Pro Module don't support for searching into virtuemart custom fields. But it supports partial/ substring matches. 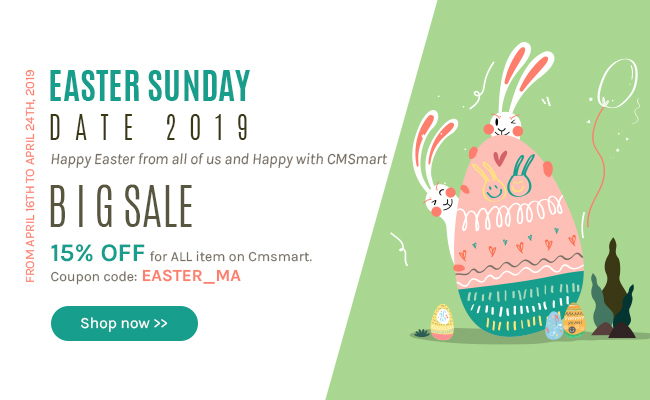 If you any questions about our products, fell free to contact with me via email janet@cmsmart.net. I will answer all your questions. I tried different versions of virtuemart and did search in them and found that there is a fundamental error in virtuemart component search core which result in pagination problem. 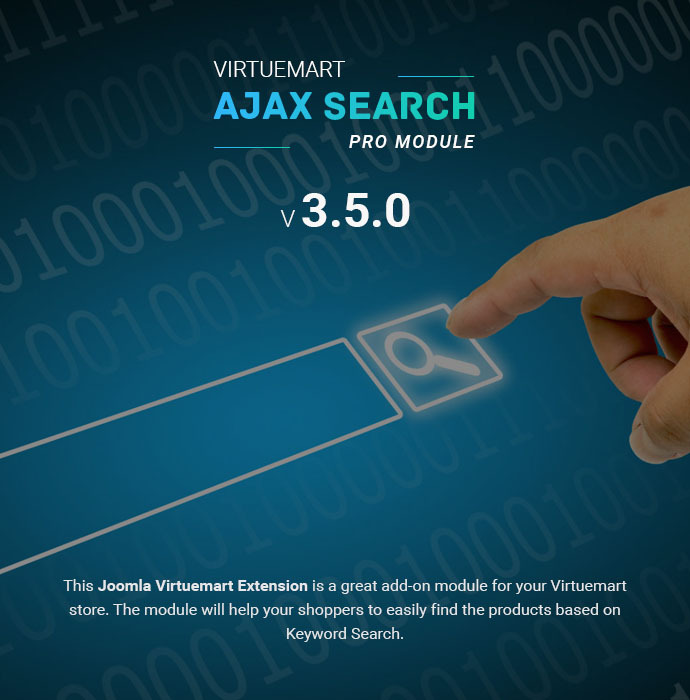 Also I have tried some ajax search modules but all of them use built-in search functionality of virtuemart which will result in same problem. I want to know if your module has same behavior or not. I mean if your module has its own functionality for search or it uses the virtuemart built-in search? I am sorry for reply late because we had 2 days off week. Our product uses the virtuemart built-in search. But you don't worry if you have a problems, our developer team will help you resolve it. + Displaying no-image on search module if there is no image on product. # Fixed in admin configuration: characters can’t be inputted, only positive number.